The Goldfish Creative – greeting cards that pop! If you often have trouble finding the perfect card or like to be ultra-organised with cards on hand ready to post at any moment, then look no further than these funky cards. The Goldfish Creative is a Hong Kong-based boutique design company with an eye for unique, smart and distinctive stationery. We have our reader Tammy to thank for bringing these fabulous cards to our attention. I love the Pop Cards. 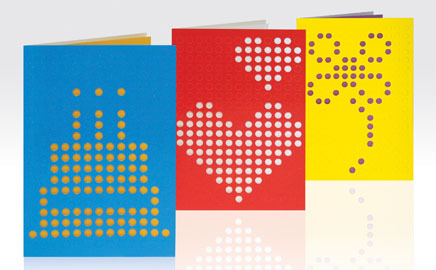 Be it a birthday message or a quick hello you want to send, you can punch out your own design on the card covers. 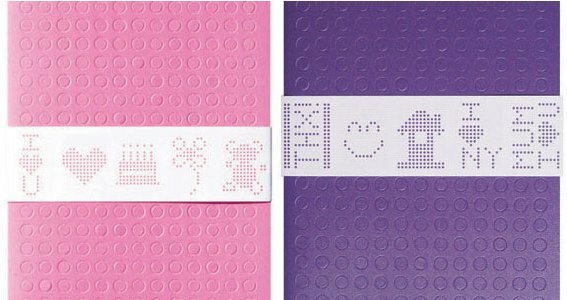 It’s easy – the Pop Card is covered in hundreds of neat perforated circles just waiting for your design. Your imagination really is the limit but to help you along each card comes with some design ideas. If you’re a little less artistic, the Highlight Card is your ultimate. Each card features a plethora of messages and all that is required of you is to highlight the appropriate message for the occasion. Too easy and so fun that the recipient won’t think it’s lazy at all! The Goldfish Creative Pop Cards and Highlight Cards cost $8.90 each and are in stock at Top Three By Design.